Keyestudio Mega Sensor Shield V1 simplifies the complex circuit by connecting multiple sensors. It works with all programming software for Arduino. The analog and digital interfaces are available on mainboard, in easy to find steering gear line sequence. Professionals highly preferred to make the simple and high performance circuit with imported quality Mega Sensor Shield V1. Place your order now and get it at your doorstep from Amazon Pakistan. The advantages of various spread sensor boards have be integrated into the design of our Arduino MEGA Sensor Shield V1, which PCB metallurgical deposition processing is applied. In the design, all digital and analog interfaces are spread out in the form of steering gear line sequence with the mainboard, and the bluetooth mode communication interface, SD Card module communication interface, APC220 wireless RF module communication interface, and RBURFv1.1 ultrasonic sensor interface are applied specializedly. 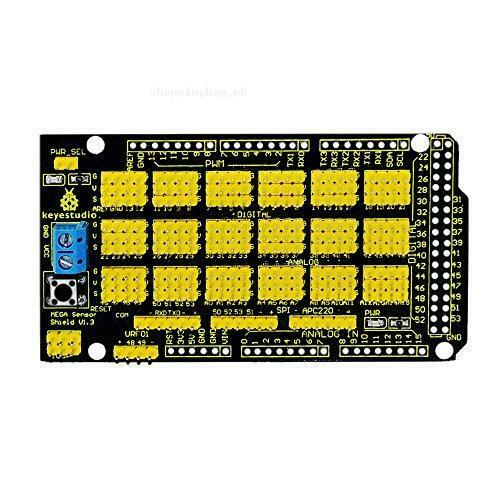 This independent spreading design makes the sensor board more more convenient and easy to use. For a beginner of Arduino, she or he do not have to have a headache for the complex circuit connection. This type of Sensor Board Shield simplify the circuit in the true sense to make the commonly used sensors easily connected. You need only a general 3p sensor cable (both digital and analog cable) to connect a sensor and after finishing circuit connection, write the corresponding Arduino procedure and download it to the Arduino MEGA controller to read the sensor data, or receive returning data of wireless module and finally finish your own interactive work easily after processing.